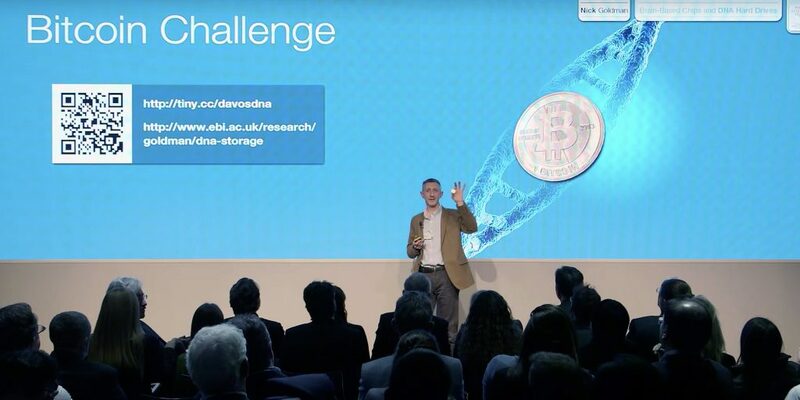 Antwerp, Belgium 22 January 2018 – University of Antwerp PhD student Sander Wuyts has won the DNA Storage Bitcoin Challenge, issued by Nick Goldman of the European Bioinformatics Institute (EMBL-EBI) in 2015. The value of the Bitcoin has risen rapidly in three years, while the value of scientific progress is inestimable. 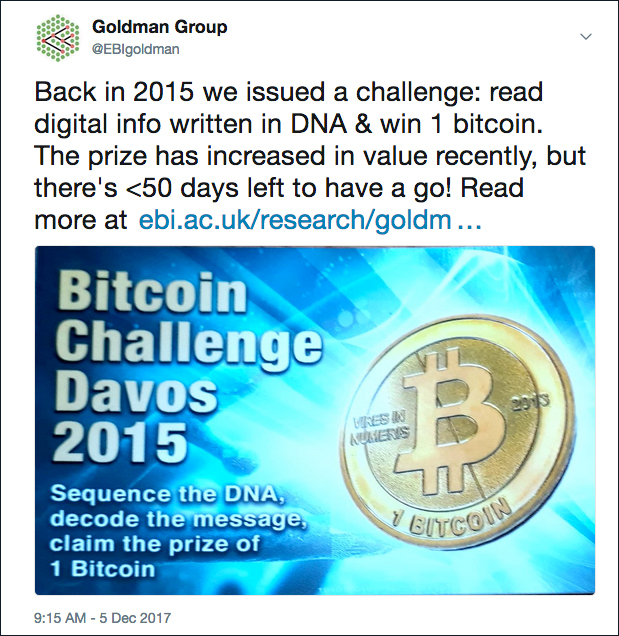 DNA Storage scientist Nick Goldman issued the Bitcoin Challenge at World Economic Forum meeting in Davos, January 2015. One week before the 21 January 2018 deadline, PhD student Sander Wuyts of the University of Antwerp is the first to decode the encrypted Bitcoin, taking ownership. Initiative of bioengineering PhD student inspires future research. 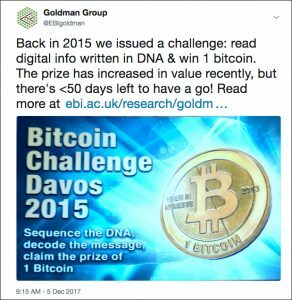 On 21 January 2015, Nick Goldman of the European Bioinformatics Institute explained a new method for storing digital information in DNA to a packed audience at a World Economic Forum meeting in Davos, Switzerland. At the end of his talk, he issued a challenge. 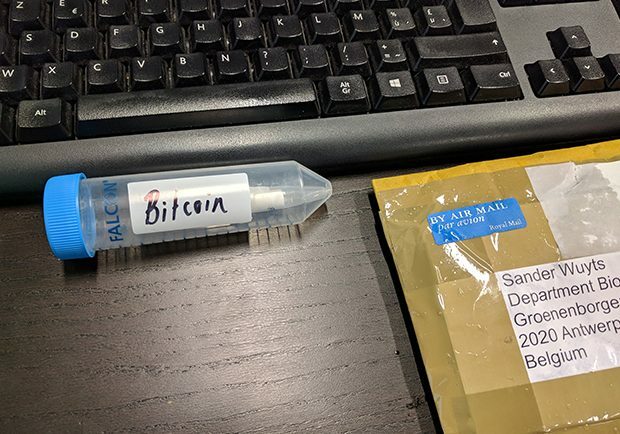 Goldman distributed test tubes containing samples of DNA encoding 1 Bitcoin to the audience (and subsequently posted samples to people who requested them). The first person to sequence (read) the DNA and decode the files it contained could take possession of the Bitcoin. To win, competitors need to decode the DNA sample to find its ‘private key’. All they needed was the sample, access to a DNA sequencing machine and a grasp of how the code works. The value of a Bitcoin in 2015: around €200. The deadline: 21 January 2018. One week from the deadline, Sander Wuyts, PhD student in the Department of Bioscience Engineering at the University of Antwerp and Vrije Universiteit Brussel, Belgium, was the first to master the method and decode the private key, taking possession of the Bitcoin. Its value on 19 January 2018: around €9500. Now completing his PhD in microbiology – exploring the universe of bacteria through DNA – Wuyts has the right balance of passion, coding skills and great colleagues to tackle complex puzzles like Goldman’s “DNA Storage Bitcoin Challenge”. Wuyts saw Goldman issue the challenge on YouTube back in 2015, but it was the tweet about the deadline in December 2017 – plus the skills he had acquired in the meantime – that made him swing into action. The method for encrypting digital information in DNA was developed by a group at EMBL-EBI. Bitcoin, a cryptocurrency, is based on Blockchain software, which is Open Source and free for anyone to use. Once he got started, Wuyts became increasingly aware that decoding the Bitcoin wouldn’t be quite as simple as following a recipe. After one failed attempt and an essential pause over Christmas, he worked tirelessly, with the help of his colleague Stijn Wittouck, to put the data from sequencing into the right order and decode the files. Wuyts, who once invested poster-prize money in cryptocurrency to figure out how this technology works, is proud of having won the challenge but cautious about the prize. Wuyts intends to use some of the proceeds from selling the Bitcoin to invest in future science projects, thank the people who helped him, and celebrate passing his PhD in style, with everyone who has supported him along the way.